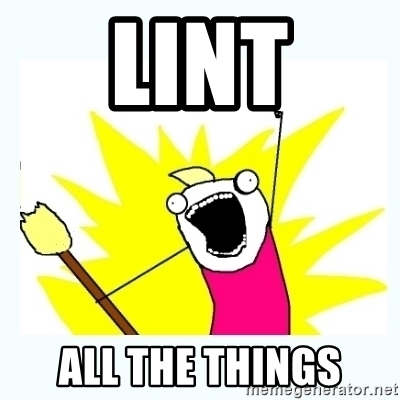 As some of you know, lately I’ve been very much involved in a few linting projects as well as spending plenty of time contributing to the linters themselves. One thing I’ve been missing so far in my own projects is the ability to lint my CSS so I can easily enforce best practices and, more importantly, detect potential problems in my rules/syntax. This has been possible in projects which use CSS as-is for some time, using the excellent open source stylelint. However, it has been a bit of a struggle when using a project like lit-element due to the fact that most or all stylesheets are contained within template literals (for several reasons I won’t go into here). A PR or two recently got merged, though, so it is no longer such a struggle! As mentioned before, the problem here is that the styles exist inside a template literal rather than an actual stylesheet (i.e. a css file). Due to this, stylelint can’t lint it out of the box as it has no idea how to extract the CSS. Here is where the very useful stylelint-processor-styled-components processor comes in handy and can be gently pushed to into supporting our needs. Looks familiar, right? If only we could tell the processor to look for css templates rather than styled templates, right?? The strict flag is a recent addition from me. I added it because the processor’s default behaviour is to extract CSS from all lit-element imports, which means it will try (and fail…) to lint html contents too. This flag pretty much enables a little stricter parsing so only the named import is parsed. So this’ll be fairly straight forward! Simple. We enable the processor, then we tell it to only parse CSS from lit-element’s css template function and we extend the provided configs to do some bits of leg work for us. I was stuck for quite some time having literally no clue how on earth I lint some “pseudo-CSS” from inside some template expression. A few people seemed to be in the same situation, so I hope this helped you out and gave a good idea of the direction to head in. Don’t forget to try out a code formatter too, such as prettier! You should totally make use of something like this instead of relying on stylistic lint rules. I had such crazily customised lint rules until I came to the revelation that I just need to format code automatically instead of relying on mere humans. Now our development process is much smoother, highly recommended.